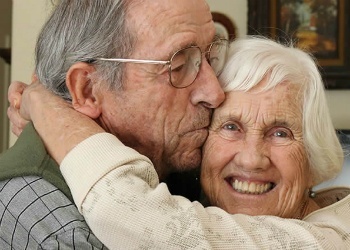 Dementia is a difficult burden for some couples, but there are ways to overcome it. By being prepared for the challenges that dementia can present, you can minimize frustrations and anxiety and instead emphasize the love that the two of you have always shared. Try to keep a similar routine from day to day to provide a bit of continuity. Establishing a daily routine will help keep things consistent and subconsciously familiar. You don’t have to do exactly the same things every day — in fact, a bit of variety could be helpful. But try to do these activities around the same time every day so that your loved one can return to their routine afterwards. If your spouse loves gardening, don’t tell them to stop! Encourage them to keep up their favorite activities, but keep an eye on the tasks that they struggle to complete. If your loved one is struggling to trim bushes or other plants, then suggest that they pull weeds instead. As long as they are not harming themselves or others, then involvement in their favorite activities is a good thing. As dementia sets in, communication with your spouse will change. They will not understand you in the same way, which is a huge cause for frustration. By adjusting your language and mindset a bit, you can continue to communicate with your spouse in a loving fashion. Sometimes dementia leads to bouts of difficulty. Loved ones can become angry and agitated. They can usually be calmed by kind words or actions, but sometimes, they result in physical abuse. If this happens, do not brush it off. It is always a big deal. Tell their doctor so that it can be handled professionally. Living with dementia is difficult, but caring for someone who is living with dementia has its own challenges. Make sure you have a few people that are there to support you as you continue along this journey. An effective support system will help you through the toughest parts and help you release your frustrations in a healthy fashion. Know where to go when you need help. Dementia care is not an instinctive process, but it is one that many experience. There are many professionals that have studied dementia and proper care, and they would be excellent resources. But, if you are more comfortable using your own research skills, there are plenty of online resources for helpful tips on dementia care. Find these resources long before you need them so that you know exactly where to go when you need it. At the end of the day, always remember how much you love your spouse. After all these years, they deserve the best care possible. Do what you can, but investigate memory care if it becomes too much for you to handle. It’s not fair to you or to your spouse if you take on more than you can handle. With a little bit of planning, organization, and a whole lot of love, you and your spouse can find the right balance that works for you.